The Loyal Nine planted the seeds of revolution. George Grenville was a British statesman born into an influential political family. He became the British Prime Minister in and the primary focus of his government was to bring spending under control. Grenville, a whig, advocated the supremacy of Parliament and a strong central government. During his term in office from 1763 – 1765, a major point of contention at the time was the incredible cost of defending and protecting the colonies and the British expansion into the American frontier. Near the Appalachian Mountains, the British had stationed 10,000 troops for this purpose. While serving as Prime Minister of Great Britain in 1764, he proposed a stamp tax in a speech to Parliament. The new tax was imposed on all American colonists and required them to pay a tax on every piece of printed-paper they used. Documents, licenses, newspapers, ship’s papers, legal documents, and even playing cards were taxed. The money collected by the Stamp Act was to be used to help pay the costs of garrisoning the troops. 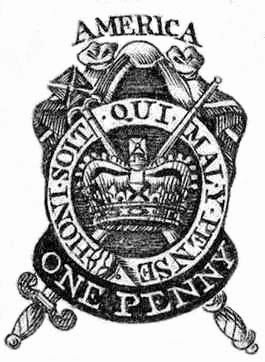 On February 17, 1765, the Stamp Act was passed in the House of Commons by an overwhelming vote of 205 to 49; on March 8, it unanimously passed in the House of Lords; and on March 22, it was given Royal Assent. The law had an effective date of November 1, 1765. News of the Stamp Act’s passage reached America in May of 1765. The Stamp Act caused both anger and resentment in the colonies – not so much because of the imposition of a tax, but because of its manner of enactment and means of enforcement. The colonists believed that it violated their rights as Englishmen to be taxed without their consent. Such consent, in the view of the colonists, could only be granted by the legislatures of the colonies in which they resided. The colonists believed that any laws passed affecting them were illegal under the British Bill of Rights of 1689. A slogan was quickly adopted throughout the colonies: No taxation without representation. Boston, Massachusetts became the epicenter of the colonist opposition to British rule. In 1765 a group of Bostonians formed a social club — attempting to avoid the scrutiny a political organization might provoke. Their purpose however was more than social. This group of nine Bostonians, formed and operating in secrecy, plotted a response to the Stamp Act. They called themselves The Loyal Nine. Although they were respectable merchants and tradesmen; they were not necessarily the most prominent Bostonians. They were private and unassuming, avoided undue publicity, and were diligent in their secretiveness. The names of The Loyal Nine aren’t prominent in American History books. But these nine men sowed the seeds of the American Revolution. They were average, hardworking Americans — fighting against tyrannical rule. Henry Bass, a merchant and the cousin of Samuel Adams; Thomas Chase, a distiller; John Avery, also a distiller and The Loyal Nine’s secretary; Stephen Cleverly and John Smith, braziers (tradesmen who worked with brass); Thomas Crafts, a painter; Joseph Field, a seafarer; George Trott, a jeweler; and the most well-known among The Loyal Nine — Benjamin Edes, the printer of the Boston Gazette. John Adams recalled in his diary that The Loyal Nine met in one of two locations; either in a small compting Room in Chase and Speakman’s Distillery or under the foliage of a large elm tree in nearby Hanover Square. The tree would soon become known as The Liberty Tree. Until its destruction by British soldiers in 1775, The Liberty Tree would serve as a meeting place for fiery speeches and as a rallying point for patriotic demonstrations. Knowing they were going to need help organizing a resistance movement, The Loyal Nine turned to Ebenezer Mackintosh and his gang of miscreants known as the South Enders. Mackintosh was a poor shoemaker who was generally considered lower class in Boston at the time. After the death of his first wife, Mackintosh became involved in the militia and later joined the infamous Fire Engine Company No. 9 in South Boston. Over time, he became a fixture and a leader in the poor communities of Boston’s South End. As the head of the fast growing South End gang, he coordinated activities of the annual Guy Fawkes Night held on the fifth of November. In 1605, Guy Fawkes was a member of the Gunpowder Plot to assassinate King James and several members of the House of Lords. The plot failed, but Fawkes became well known for his insurgent activities. Animated masks honoring Fawkes began to surface featuring an oversized smile and red cheeks, a wide upturned moustache and a thin vertical pointed beard. Today, the Guy Fawkes mask is the widely recognized symbol of the hacktivist group Anonymous. Mackintosh used the occasion of Guy Fawkes Night to light an enormous bonfire and recruit more members into his gang. He orchestrated most activities in the south part of the city. Inciting public disturbance was not foreign to them. The Loyal Nine needed soldiers — insurgents. They convinced Mackintosh to put aside his local quarrels with Henry Swift and the North Enders gang to direct their hostilities towards opposing the British and The Stamp Act. The enemy of my enemy is my friend. Mackintosh, Swift and the hundreds of their gang members agreed to work together. While they was doing this, the Sheriff began to read the proclamation for the mob to withdraw. Word of the defiance spread throughout the colonies. Incidents of protest had been occurring in other cities and towns from Fort Halifax in Maine to Charleston, but now force had been introduced as a tool of the masses. The activities of The Loyal Nine and their alliance were having the desired effect — the tax collectors were resigning out of fear. These Patriot mobs used tactics of fear, force, intimidation and violence to demonstrate against the Stamp Act, and they targeted pro-Stamp Act supporters and officials. The Loyal Nine organized these mobs by putting anti-Stamp Act pamphlets and signage all over the streets of Boston, hanging effigies of public officials and others who supported the Stamp Act. On November 1, the day enforcement of the Stamp Act was to begin, there appeared in a Boston newspaper a caricature by John Singleton Copley, entitled, “The Deplorable State of America.” The cartoon expressed the emotions of the citizens of Boston who felt intimidated by the revenue measure. The power of the press was behind The Loyal Nine. Four days later, the citizens of Boston were greeted by an unusual scene – Ebenezer Mackintosh, leader of the South Enders, and Henry Swift, leader of the North Enders, two bitter rivals, were leading their men side-by-side down the streets of Boston. These were two opposing gangs that had gone at each other with clubs and knives on Guy Fawkes Day for as long as anyone could remember. The citizens were amazed and confused – what had happened? The answer became known as the Union Feast. Samuel Adams, with the assistance of John Hancock, organized a series of dinners and invited all classes of men, meaning the two mobs, to share a meal together. Sir Francis Bernard, former Governor of the Province of new Jersey recalled in his writings that some of The Loyal Nine were present and with Heart and Hands in flowing Bowls and bumping Glasses, the Sons of Liberty were born! The Loyal Nine kept up the pressure on the tax collectors. On the evening of December 16, Andrew Oliver received a notice from The Loyal Nine that his presence was requested at the Liberty Tree the next day to publicly resign his office of Stamp Master. The next morning he sent for his friend, John Avery whom he hoped would act as an intermediary between himself and The Loyal Nine. Avery told him that it was too late – that the effigies were already prepared. Oliver then offered to resign at the courthouse, but was told that would not be acceptable. Shortly before noon, Mackintosh appeared at his door for the purpose of escorting Oliver through the streets of Boston to the Liberty Tree. Because there was a heavy rain, Oliver was permitted to read his resignation from an upper window of a house next to The Liberty Tree. [They] gave me a particular Account of the Proceedings of the Sons of Liberty on Tuesday last in prevailing on Mr. Oliver to renounce his office of Distributor of Stamps, by a Declaration under his Hand, and under the very Tree of Liberty, nay under the very Limb where he had been hanged in Effigy, Aug. 14 , 1765. Their absolute Requisition of an Oath, and under that Tree, were Circumstances, extremely humiliating and mortifying, as Punishment for his receiving a Deputation to be a Distributor after his pretended Resignation, and for his faint and indirect Declaration in the News Papers last Monday. Yesterday I wrote you a few lines, by Dr Tufts, informing you the Sons of Liberty desired your company at Boston … on Monday next, because they want you to write those inscriptions that I mentioned to you when last at Boston; one in favor of Liberty, not forgetting the true-born sons, and another with encomiums on King George, expressive of our loyalty …P.S. Destroy this after reading it. In this present Parliament assembled, and by the authority of the same, that from and after the first day of May, one thousand seven hundred and sixty-six, the above-mentioned Act, and the several matters and things therein contained, shall be, and is and are hereby repealed and made void to all intents and purposes whatsoever. According to the Boston Gazette, the forty-fifth and final toast made was Strong Halters, Firm Blocks, and Sharp Axes to all such as deserve either, followed by the discharge of a cannon and three cheers. The insurgent activity of The Sons of Liberty continued over the years — some more famous than others, but all leading to a seminal moment. On November 27, 1773, the first of three ships carrying chests of tea arrived in Boston Harbor. Members of the Sons of Liberty met at the Green Dragon Tavern and organized night patrols along the wharf to keep watch of the ships; others organized a series of meetings in the Old South Meetinghouse to discuss whether to confiscate the tea, or destroy it. The patrols were in existence for nearly three weeks. Among those on duty one of those nights were three original members of The Loyal Nine — Henry Bass, Thomas Chase, and Benjamin Edes. “I recollect perfectly well that, in the afternoon preceding … the destruction of the tea, a number of gentlemen met in the parlor of my father’s house, how many I cannot say … I was not admitted into their presence … They remained in the house till dark, I suppose to disguise themselves like Indians, when they left the house and proceeded to the wharves where the vessels lay. After they left the room I went into it, but my father was not there. For a period of ten years following the formation of The Loyal Nine, tensions between the British government and the colonists grew. As pressures built in the America, chapters of the Sons of Liberty were formed all over the Thirteen Colonies, especially throughout New England, Virginia, and the Carolinas. As The Sons of Liberty grew, so did their desire to adopt its own heraldry. Heraldry was used throughout history as a means to express a groups pride and loyalty. In 1767, the Sons of Liberty adopted a five red and four white vertical striped flag as the group’s formal standard. It became known as the Rebellious Flag and the nine stripes paid tribute to The Loyal Nine. The leaders of the revolt, the Sons of Liberty, were faced with a chance to fundamentally change the course of America. They faced a choice — continue to live under tyranny or choose freedom. They chose freedom. By 1775, their opportunity became reality and the war for independence began. But the seeds of freedom were planted by nine brave Bostonians who had a vision and the courage to stand by their convictions — The Loyal Nine.